Well the past 5 years have been fun but I have bought a replacement for my Sky. LDK long block. DDM Works clutch kit, brace bundle, oil catch can and SS brake lines. Stoptech Sport pads with ATE Type 200 fluid. Fujita intake and charge tubes. Gutted stock downpipe. Tuned with HP Tuners. Last edited by KappaTarbo; 04-09-2019 at 09:10 AM. Just my personal preference, the Sky is a much nicer looking car. I'm sure you will enjoy your new toy though. I wasn't going to say it, but since you put it out there, I can't help but agree. I do like the Corvette, but the Sky is aging beautifully and I still find it to be quite a stunner. Nearly seven years after I bought mine there isn't really anything I could consider replacing it with, at any price. From the few to the many. I have had 3 Vettes. I understand the trade. I'd ADD a Corvette to the stable (especially the current Stingray) but wouldn't replace my Sky. Nice Vette and good luck with the sale sir. Isn't the engine on both of those in the wrong place? 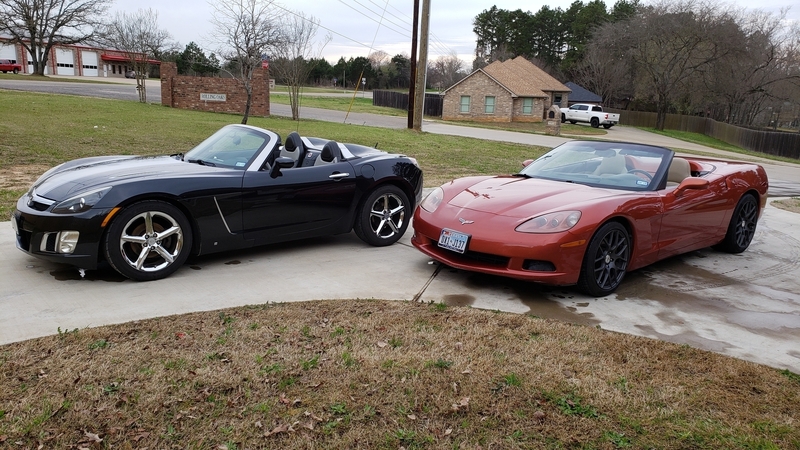 Enjoy the Vette, but keep the Sky if you can and put it away for a while. Beautiful C6 - Similar looks and a lot more power. Congrats and enjoy, now that spring is here! Well I guess they are both convertibles! You should keep the Sky! I guess you just want to be like everyone else? Regardless, enjoy your new ride. Last edited by boboborino; 03-29-2019 at 06:28 AM. So far I think I do like driving the Sky better. It feels smaller and more...zippy. I think the Corvette just needs some suspension mods done to it. It has been fun being able to pick which car I want to drive each morning. But I really do enjoy the Sky quite a bit. I saw where someone converted a Sky to all electric. ..... I saw where someone converted a Sky to all electric. Recently? There was a group that was going to do it back in '08 or so, but they didn't get very far. The technology wasn't quite ready, and the Kappa is really not a good platform for electrification. Nothing recent. You're probably referring to the same company. I think they ended up using the technology and process for fleet work trucks or something similar. Yes, they were called AMP then, but renamed themselves Workhorse when they switched to trucks. Now they are supposed to be working with UPS and Amazon on drone delivery from electric trucks. There was also a report last year that they had developed a manned octo-copter and were spinning off that division.